ONE OF MANY community events Capt. 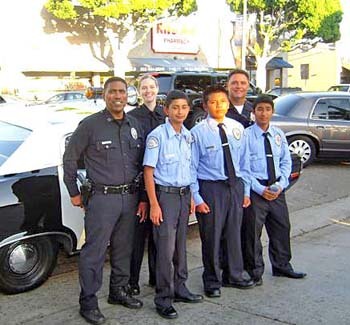 Eric Davis attends is “Night Out Against Crime,” here with cadets and staff on Larchmont Blvd. A barbecue at the Wilshire Police Station on Thurs., Sept. 18 from 11:30 a.m. to 2:30 p.m. will give community members a chance to say goodbye to Captain Eric Davis. Davis, who has been Wilshire commanding officer since 2008, will be retiring in October. Noted for his community outreach, Davis has earned the gratitude of the Hancock Park Home Owners Assoc. for his service to our area during his tenure, said Cindy Chvatal, association president. Peter Gorelick, security chairman of HPHOA, said Capt. Davis has done an outstanding job working with all members of the Wilshire community. He has always been a strong supporter of community policing and has been a great commanding officer for the Wilshire Division. Davis joined the force in 1981, and his experiences have included patrol assignments as well as highly specialized details. He was officer-in-charge of the Wilshire Area Gang Impact Team. His other assignments included narcotics division, vice, watch commander of numerous Divisions and an instructor at the Academy’s Training Division. He is also a two-time recipient of the department’s Police Meritorious Unit Citation.